If one looks at a ‘normal’ foot from the medial aspect then you will normally see a hollow or arch rising from the toes to the heel. Unsurprisingly this is called the ‘medial arch’ of the foot. The arch is produced by the length and tension of primary, secondary and tertiary structures. • Primary structures are ligaments, tough bands of tissue which hold the foot bones tightly together. • Secondary structures are tough (but slightly more elastic than ligaments) bands of tissue, such as the ‘plantar fascia’ which runs from the toes to the underneath of the heel bone. • Finally we have tertiary structures such as the medial tendons, and these arise from the deep calf muscles before passing around the medial aspect of the ankle and crossing underneath the foot to attach into various bones. The tertiary supports are designed anatomically and physiologically to move bones and create movement. They are not designed to hold the foot in a certain structure in the same way as their primary and secondary cousins. However when problems occur with the primary and secondary tissues a cascade of systemic events can be set in motion. To see what transpires we need to look at a normal gait pattern. Although there are various subdivisions and nomenclature given to describe the different phases of walking, for feet I always break it down into three categories. • Heel strike – the underneath of the heel hits the ground. • Stance phase – the foot rolls slightly to its lateral aspect, accepts and moulds to the surface, then ‘rolls’ inward toward the big toe. 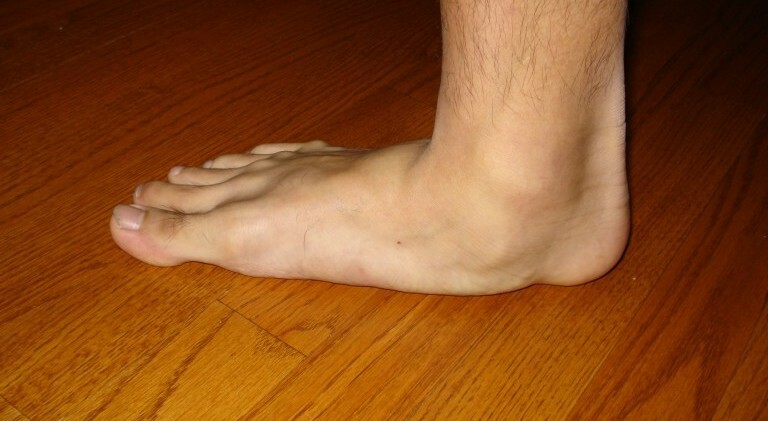 • Push off - As the foot rolls toward the big toe the length of primary and secondary structures see the heel lift from the ground and the calf muscles engage to push you forwards. Watch this link (click me) to see if you can spot the three phases. As a consequence of ligaments and fascia lengthening in the foot a whole host of local and global problems can arise. This is where the field of ‘systems’ in ergonomics arises. The human body, like any other group of self-contained and inter-related structures, has to be seen as a system trying to maintain balance in order to continue. If disturbance is created in one part of the system then some compensatory mechanism has to occur at that site, or some point distant, to make good that error or deficiency. Let’s take our example of the gait cycle above. Normally the tension of ligaments and fascia help ‘lock’ the foot structure when the cycle arrives at the big toe. If these tissues lengthen the cycle continues past the big toe and the foot itself will start to roll inwards in a circular motion. This is known as over-pronation. The consequence is that the primary and secondary structures become further lengthened, creating a systemic feed-forward effect that simple worsens the original stretching issue. At this point it’s not unusual for the condition plantar fasciitis to occur with pain of varying severity (usually worse after rest) on the heel bone or into the medial arch. Separately or occasionally combined, the tertiary tendon structures on the medial side of the ankle can become irritated through being overstretched, or by their having to combine their primary role of movement with that of arch support for which they are not originally designed. In the words of the song the foot bone is indeed connected to the shin bone, and if the foot and ankle roll inwards they will make the tibia rotate too as the systemic effect migrates up the lower limb. At this point it’s not uncommon to see pain around the kneecap as it is forced to move in an abnormal way, and misaligned with the groove on the bottom of the thigh bone in which it normally glides smoothly. Similarly the tendon attaching the kneecap onto the top of the shin can also be forced to work from too acute an angle causing inflammation or 'patella tendonitis'. Moving onwards in the kinetic chain the hip also rotates inwards, rubbing the ilio-tibial band excessively over the bony part of the upper high bone know as the greater trochanter. Trochanteric bursitis can arise as a consequence of the friction pad, or 'bursa', between band and bone being compressed and subject to excess friction. If the lower limb rolls inwards excessively the lower back will likely extend, forcing the vertebrae closer together with the numerous spinal sequelae this can entail. Finally if one foot becomes less mechanically efficient and therefore apropulsive on one side, the systemic effect is that the opposite foot has to work harder to push you forwards and get you around. From here it doesn’t take a great leap of imagination to realise that these systemic effects can pinball from one side of the body to the other, and at some point distant to the original issue. If the primary and secondary structures start to creep and deform it's not simply a case of using an Allen key to re-tighten them. Unfortunately they're not going to return and other mechanisms and modalities are required. For first time tendonitis or fascia issues then from a physiotherapy perspective electrotherapy works well combined with frictions, and supportive taping. This can take away the pain, prevent abnormal gait patterns leading to secondary systemic effects, and allow the soft tissues to cool and adapt to a new position. For those who are clearly going to embark down the road of multi-regional problems, or have these already, then orthotics are usually key; usually in combination with lifestyle advice on footwear, appropriate regimens or training schedule if the patient is a sportsman/woman, and exercises to strengthen the tertiary muscular structures. Naturally Lakeside Physiotherapy and Ergonomics can assist with all of the above! Once again, thanks for reading and hope to see you back on the website soon.